DALY CITY, Calif. — On a Chamber of Commerce San Francisco day brought to you by Karl The Fog, the Dragons convened at Lake Merced Golf Club for our July monthly tournament. With rebuilt bunkers and the AJGA having just played a tournament the same week, the course is tournament-ready as usual, and gave the A-Flighters in particularly a good test. Mike Lum put together a tidy 1-under 71, including a kick-in eagle, for field low gross, and A-Flight low net (68). The next guy in, Brian Miller, was in the black, with 77/net 73. Tournament director Peter Lyu came in third (84/net 74 card-off) and Tom Yee, retaining good form from his NCGA championship run with Chris Chong, finished fourth (82/net 74 card-off). Down in the B Flight, playing off the white tees, those Dragons had a better go of it. It took a net 67 by Jon Chong to win the flight. Davis Lee continues to improve in all facets of the game, putting together an 81/net 69 that playing partners said should easily have been gross 79. Lake Merced members Jeff Yee (84/net 71) and rookie John Park (93/net 72) came in third and fourth, respectively. Right off the bat, Mike, with the first pick, went with one of the best Weekender players of recent years in Mieko Sugimoto. Davis played a hot hand first, in picking rookie John Park, who placed at Lake Merced yesterday. He also picked up the NCGA Four-Ball Champions Chris Chong and Tom Yee — pretty darn sure that we’ll see these two guys playing together on Day 1 Best Ball. Mike appears to be banking on more veteran experience in picks like Jon Chong, Karen Fong, and Jason Kung, but is also saddled with the walking wounded, Brian Fong (knee) and Lawrence Ma (back/hip), and one guy who passed out from altitude sickness the last time we were in the High Sierras. The captains will be making their Best Ball pairings in the coming days, and as per recent tradition, the Sunday singles will be picked President Cup style on Saturday night at the members dinner. You are also reminded by director Chris Wong to quickly finalize your accommodations for the tournament, and Weekender chair Mike Gui will have further announcements on the Friday early-bird practice run at Geona Lakes and the members dinners. NEW MEMBERS: The Dragons Golf Club introduced and welcomed Tim Wei and Jiro Lin yesterday at Lake Merced. 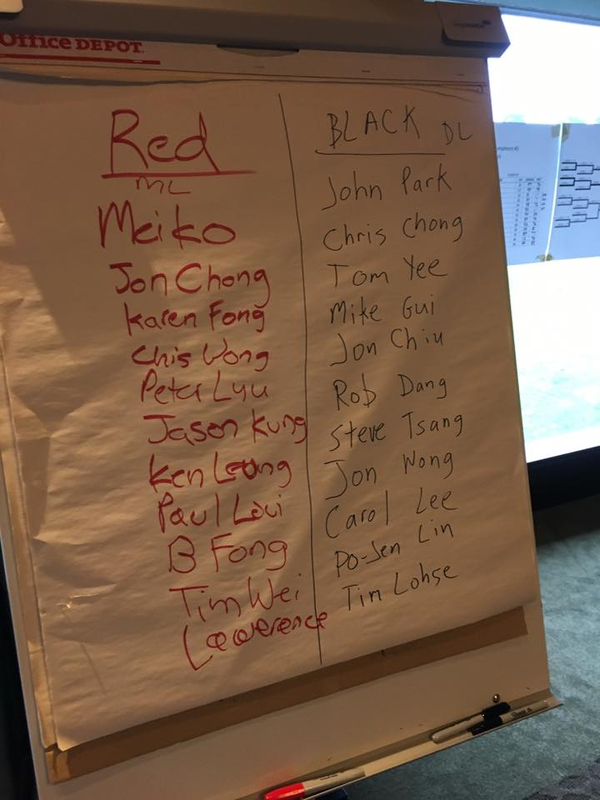 Jiro comes to us courtesy of Wyatt Lin, while Tim Wei is a member of Lake Merced and referred by Jonathan Wong and Lawrence Ma…. LOST AND FOUND: If you’re missing a black neoprene 7-iron headcover, please respond to us ASAP. One was turned in as a lost-and-found item…. SURPLUS DGC RED CLUB SHIRTS BY ADIDAS: There are still a few L and XL sized Red adidas club shirts available at cost ($30). Please contact us if you would like to get one….